Visual Studio Application Lifecycle Management (ALM) solution enables businesses to manage the entire life of the application development, reduce cycle times and eliminate waste in order to provide a continuous stream of business value. When effectively implemented, ALM practices break down barriers between teams, enabling organizations to meet the challenges and to provide high quality software at a faster pace Companies using ALM also benefit from a greater reduction of waste, faster cycle times and greater agility. What is the probability of my application to crach ? Will my Infrastructure be able to stand in front of a large amount of users? When integrating a new software component , is it possible to have negative impact on the existing one? . Validate and maintain the quality of our application through the unit tests. 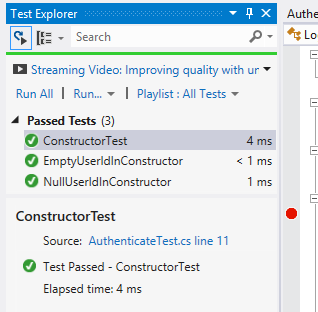 Next, we switch to using a test driven development (TDD) approach in which we write unit tests before writing the production code. There are actually many profiles of potential testers : all project developers will not have to perform load tests or web tests, this task is delegated to a small group of people. 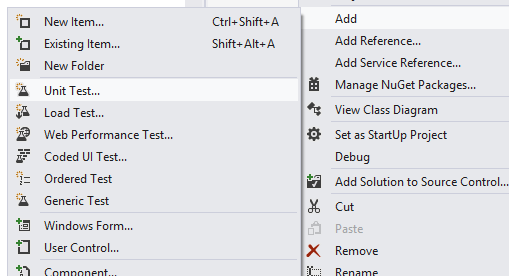 We are using visual studio 2012 so as to be able to cover a large number of test case. In contrast, people who perform unit tests will be more numerous.. It is therefore imperative to conduct a battery of tests to different aspects of the application. To identify gaps in earlier and be able to work their corrections cost, this exercise should take place throughout the development process. Unit tests verify that every part of our application responds correctly to the functional requirements that have been expressed and it has no bug. Throughout the development of the application, re-running the tests automatically (when generating build as seen in the previous chapter) or when editing the corresponding module, we can ensure that we non-regression system. 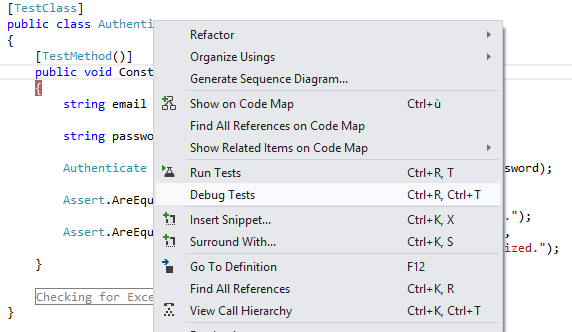 Since Visual Studio 2005, Microsoft proposes using MSTest, its own testing framework, fully integrated into the IDE. The principle is simple: the attributes are used to decorate classes and methods and have written assertions. This is the conclusion of the latter indicate that if our test is passed or not. 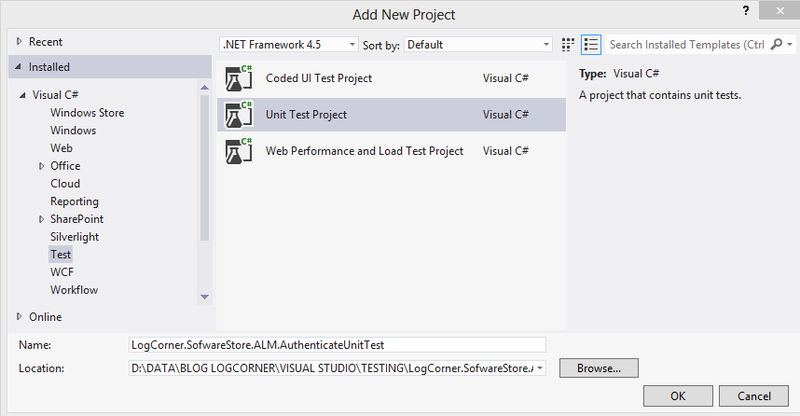 Create a project class Library and add our class Authenticate as a sample for testing. It is very simple to write the test : we pass parameters such as emai and password and verfy that the values affected by the constructor and parameters are same.